The Tories are going to win on Labour's terms - when they have to enact horrible policy they may end up hated for a generation. Will Cameron's be lucky enough to find his own Falklands before his term runs out? The cuts are going to be deeper and harsher and probably less fair than the Thatcher years. There won't even be tax cuts to help grow the economy. The Tory/Lib pact is going to need a get out of jail card. Something to fall back on for an election in 2015. Margaret Thatcher's Falklands moment was, despite the socialist warmongering propaganda, an unforeseen event And a hugely risky one. Without success in the islands the 1983 election would have been lost. 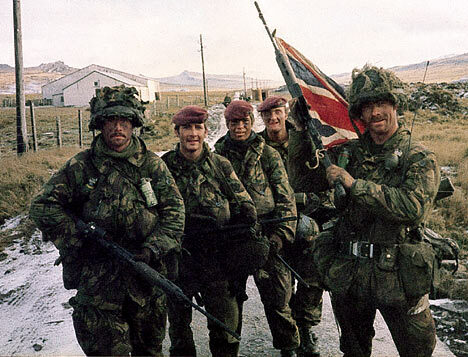 The Falklands changed Britons image of themselves. The end of the sick man of Europe. The start of growth on a par with other European countries that had been absent for 15 years. But Dave needs a plan in hand. What is the vote winner? What is in that box marked 'Only open in case of emergency', encased in lead and sealed deep in a disused nuclear silo. What could that plan be? Massive boom, 20s, massive depression 30s, what was it that happened in the 40s again? Someone somewhere will see a military solution to their problems and we will cull enough of us to get through the next 50 to 60 years in peace again. Not a nice thoiught but I fully expect a major war of some sorts in the next 20 years. He might bring back conscription. It would end benefits for the idle. I don't think he has such a plan, though others may have. I think ke imagines he can ride the tiger somehow, or at least until it gets him to where he wants to go, like the Blair creature to whom he gave a standing ovation in Parliament. Postal voting! Print up ballot papers with the Tory 'X' already printed on. Give the reds a taste of their own electoral fraud medicine. An elected second chamber with a longer or different electoral cycle that has the right to halt legislation. Most of the country vote libdem or con and would put con / libdem as the first alternative. Just by doing this you lock in liberal / conservative control for a generation. Use the unemployed to rebuild Hadrian's Wall. Nah.. its the troops home from Afghanistan. Leave the conflict brewing for four years and then announce its unwinnable and don't intend to waste more lives. Pull troops out so all home within 8 weeks of the election. Oh I agree, any winning party may prove unelectable again for a decade if they do anything useful. I have to agree with 'Puma' - it's Afghanistan that will do it. Cameron will scrape in. Then the Conservatives need to find a principled leader before the second election so that they can get a clear majority. This leader needs to heed the three quarters of the MPs who are Eurosceptic and proper conservatives. With that done, it's pretty plain sailing. - Have lots of investigations to learn what went wrong on pensions, PFI, gold sale, GP contracts, NHS supercomputer, Immigration etc, Reports scheduled to come out monthly at first, rising to thrice weekly in four years time? - Offer incentive schemes to find the biggest sources of waste with the civil service. Maybe with league tables overall / by dept / by region. - Provide an online reference library and timeline of Labour policy initiatives and there success / demise, with parallel timelines of bad news announcements. Major updates to be launched in time for the next set of cuts. - Maybe highlight how some government departments have outsourced their functions overseas? i.e. British jobs for Indian Workers! Further, that this continues unabated when the Government is spending billions on saving jobs. For instance these might be worth a look. I think if all the MP's bogged off no-one would notice and the world would keep on turning. Simple. Day one of Tory govt - call in IMF. Ask for forensic investigation into UK's finances, including all the off balance sheet stuff, pension liabilities etc etc. Get it all in writing from someone outside. Take the IMF figures, draw up several responses (mostly cuts & a few tax rises vs few cuts & lots of tax rises vs middle way of some of each). Put them to the nation in a referendum. Enact what the people decide. That way the least amount of approbrium can fall on the Tories heads. If this is all done within 6 months of the election Labour will be blamed almost entirely. Job done. Send the postal voters back to Mogadishu? Like them all. But no one thought of the EU? A Tory minority govt/Lib Dem coalition struggling to cope with the strikes and shutdowns and tax rises could offer an in/out or trade only referendum. Restrict EU immigration immediately and so on.. Blame Europe for our ills.